FR NEIL Muir has rediscovered how to walk. The Cairns Northern Beaches parish priest recently returned from the Camino de Santiago and said it “was probably the most significant spiritual thing I’ve done thus far in my life”. “It was a time to pray deeply; to reflect on my own life, the good and the bad, the sin, and the joy of God’s mercy,” he said. “Although you’re with people and you’ve got all these pilgrims, you’re walking along and it becomes extremely meditative. “It’s like one great mantra. “And you start to think who else has walked along this path? Fr Muir said there was a man there with his elderly mother who was on a walking frame. Fr Muir said he heard other priests and other laity talk about their time, saying the same thing. Even non-believers, he said, found something profound. But, he said it wasn’t easy. “You get the odd blister, it’s hard, and sometimes you don’t want to go on and do it,” he said. “But it is a time for you and God, and God helps face things on the way. Fr Muir said he brought back spiritual elements from the walk to his work in Cairns diocese. “I think I’ve reprioritised my life to an extent,” he said. “Things I used to think were important, I do them, but they’re not the priority. And Fr Muir has formed many relationships over his years, celebrating 25 years of priesthood this year. He said over those years the highlights and tough times were often reflected in the Beatitudes. “They (the Beatitudes) reflect most of the things that happen to you in life,” he said. “Priesthood is extremely privileged though, because you get to travel with people in their highs and lows – their joys and sadness. And beyond the sacraments, he said, priests were privileged because people allowed them into their lives. This was especially important in the darker times in people’s lives. “Oftentimes you don’t have an answer but you do have the privilege of journeying with them,” he said. Hitting 25 years of priesthood has also been occasion for Fr Muir to look back too. His father was a local from Cairns and his mother was from England, who immigrated to the country. “She was also a convert to Catholicism from Methodism,” Fr Muir said. “She brought other aspects of the Christian tradition; Dad was a believer, he was very steeped in an Irish Catholic background but my mother brought a new enthusiasm to the family. Fr Muir said both of his parents had a profound faith impact on him. “One was the foundation and one was energetic, really excited,” he said. Joining the seminary was also a point of reflection for Fr Muir. He entered the seminary in 1987 with 14 others in his class and said it was a time of questioning. He said questions arose about what it meant to be a Christian and a Catholic. And he found his answer to this question was entangled with his love for relationships with people and, in them, his relationship with God. It became apparent over the years that part of who Fr Muir was, was a man of Catholic education. He said he used to be a sceptic, often being someone who said, “Why are we wasting all this time on Catholic schools, when no one is coming to church”. But after being sent to the University of London to complete his masters and returning to be appointed episcopal vicar of education for the diocese, Fr Muir’s opinion shifted. 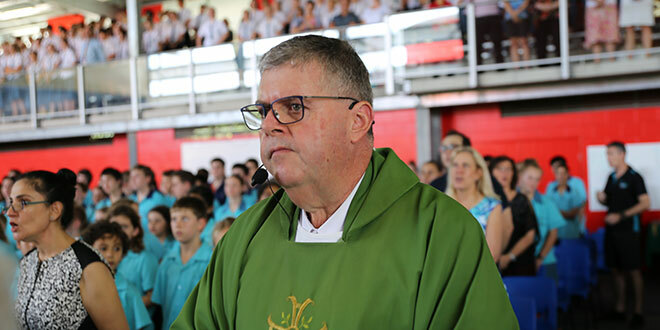 “I’ve really become appreciative of the place of Catholic education, of the work done in our Catholic schools, and the importance of keeping our schools as part of our parish and diocesan communities,” he said. “That’s really come home to me, the strong link that there should be between school and parish, school and church. But Fr Muir said Catholic education was for more than just Catholics. “You could be a non-believer but still follow the Catholic teaching and impact in a positive way on the place where you live,” he said. For his 25th year of priesthood, Fr Muir had four celebrations in each of his parish’s churches and the parish schools. “You do get very moved because all of a sudden it hits you – you start to think about all the things you’ve done and the people you’ve met,” he said. “And what’s happening here and now. As for the next 25 years, Fr Muir would like to remain a parish priest and build more relationships with his flock. He said being a pastor meant he got to listen to what people wanted to do and help bring their vision to fruition. He enjoyed it so much, he said it twice, “I love being a pastor, I love being a pastor”.